We suggest short course steroids. Discuss with patients in shared decision making. All Applies to Click for details  Strong Benefits outweigh harms for almost everyone. All or nearly all informed patients would likely want this option. Weak Benefits outweigh harms for the majority, but not for everyone. The majority of patients would likely want this option. Weak Benefits outweigh harms for the majority, but not for everyone. The majority of patients would likely want this option. Strong Benefits outweigh harms for almost everyone. All or nearly all informed patients would likely want this option. Risk of Bias No concerns Imprecision Very serious Indirectness No concerns Inconsistency No concerns Publication bias No concerns Corticosteroids may decrease the chance of taking antibiotics in patients given a prescription with instructions to take the antibiotic if unimproved or worse. What is the role of a single dose of oral corticosteroids for those with acute sore throat? Using the GRADE framework according to the BMJ Rapid Recommendation process, an expert panel make a weak recommendation in favour of corticosteroid use. The panel produced these recommendations based on a linked systematic review triggered by a large randomised trial published in April 2017. This trial reported that corticosteroids increased the proportion of patients with complete resolution of pain at 48 hours. Box 1 shows all of the articles and evidence linked in this Rapid Recommendation package. The infographic provides the recommendation together with an overview of the absolute benefits and harms of corticosteroids in the standard GRADE format. Table 2 below shows any evidence that has emerged since the publication of this article. 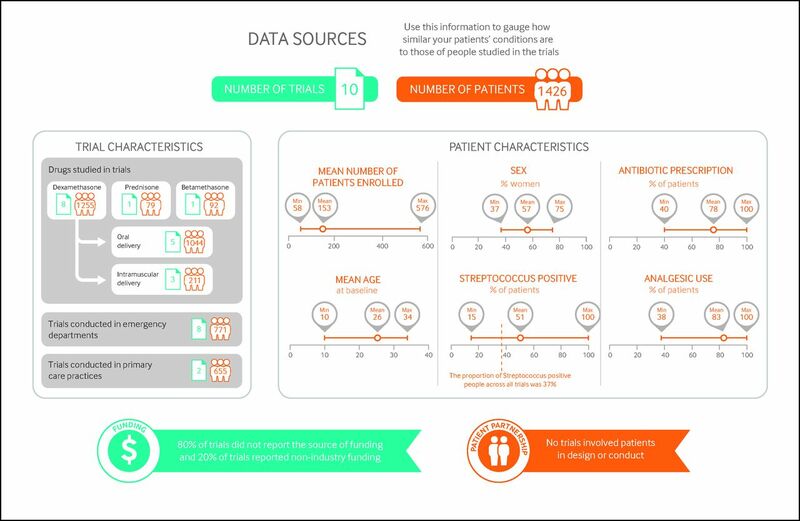 Clinicians and their patients can find consultation decision aids to facilitate shared decision making in MAGICapp (www.magicapp.org/goto/guideline/JjXYAL/section/j79pvn). Steroids somewhat reduced the severity and duration of pain by one day, but time off school or work was unchanged. Harm seems unlikely with one steroid dose. Review of all available randomised trials that assessed corticosteroids as adjunct treatment versus standard care for sore throat. Acute sore throat is defined as pain in the throat for less than 14 days. Acute sore throat could be caused by pharyngitis, nasopharyngitis, tonsillitis, peritonsillar abscess, or retropharyngeal abscess. Some patients with sore throat also experience headache, fever, muscle stiffness, cough, and general malaise. Most guidelines recommend paracetamol or ibuprofen as the first choice treatment.13 The use of corticosteroids is mentioned in few, and is generally discouraged (table 1⇓). Antibiotics are probably not helpful for pain relief in an episode of acute sore throat caused by viruses, but may help those with a bacterial infection.1415 Recommended management of sore throat varies widely, and table 1⇓ summarises current guidelines. Our international panel—including general practitioners, general internists, paediatricians, an otorhinolaryngologist, epidemiologists, methodologists, statisticians, and people with lived experience of sore throat—decided what was the scope of the recommendation and the outcomes that are most important to patients. After a parallel team conducted a systematic review on the benefits and harms of corticosteroids,16 and a systematic search for evidence about patients’ values and preferences (appendix 1 on bmj.com), the panel met to discuss the evidence and formulate a recommendation. No person had financial conflicts of interest; intellectual and professional conflicts were minimised and managed (appendix 2 on bmj.com). The panel followed the BMJ Rapid Recommendations procedures for creating a trustworthy recommendation,2627 including using the GRADE approach to critically appraise the evidence and create recommendations (appendix 3 on bmj.com).28 The panel considered the balance of benefits, harms, and burdens of the drug, the quality of the evidence for each outcome, typical and expected variations in patient values and preferences, and acceptability.29 Recommendations can be strong or weak, for or against a course of action. Figure 1⇓ gives an overview of the number and types of patients included, the study funding, and patient involvement, as well as a summary of the benefits and harms of corticosteroids for treating acute sore throat. The panel identified eight patient-important outcomes needed to inform the recommendation: complete resolution of pain, time to onset of pain relief, pain severity, need for antibiotics, days missed from school or work, recurrence of symptoms, duration of bad or non-tolerable symptoms, and adverse effects. The included studies reported on all patient-important outcomes, except for duration of bad or non-tolerable symptoms. Regarding pain, the panel appraised the likelihood of complete resolution of pain at 24 hours and 48 hours, as well as the mean time to complete resolution of pain and the mean time to onset of pain relief. Although most of the studies (80%) were conducted in emergency departments, they accounted for 54% of all patients enrolled across studies. The remaining 46% were enrolled in the studies conducted in primary care settings, and the panel was therefore confident that the evidence was applicable to them as well. Most of the studies focused in adults only (60%). The studies that focused only on children (three studies, 2% of all the patients enrolled in the studies) did not include children younger than 5 years old, and thus the recommendation does not apply to younger ages. Since the randomised controlled trials focused on patients who did not have recurrent episodes of sore throat, the panel was less confident of the applicability of the evidence to such patients, and the recommendation therefore does not apply to them. Similarly, the panel did not consider patients with sore throat after surgery or intubation, nor immunocompromised patients. The recommendation for using corticosteroids made by the panel was weak because of the modest reduction of symptoms and the large variability in patient preferences. Although the evidence indicates that the treatment works on average, it did not reduce the severity of pain dramatically and failed to improve several other patient-important outcomes. It is unlikely that new information will change interpretation for outcomes that are high to moderate quality of evidence. Corticosteroids reduced the average time to complete resolution of pain (GRADE low quality evidence). The weak recommendation for corticosteroids reflects a high value on a modest reduction of symptom severity and the time that it takes to achieve such improvement, and a substantial and important increase in the chance of complete resolution of pain at 48 hours. The panel, including the patient representatives, felt that the values and preferences are likely to vary greatly across patients, which justifies a weak recommendation. For example, achieving complete pain resolution 12 hours earlier may be of little importance for patients who feel less busy in their daily life, have higher tolerance to pain, or whose symptoms are not so severe; whereas it may be very important to patients whose ability to go to school or to perform at work are compromised, care givers wishing to reduce their children’s pain, or patients experiencing their pain as severe. The panel believes that there is great variability in how much reduction in pain severity or time to complete pain resolution each patient would consider important. However, the greater the reduction in hours to achieve complete resolution of pain, the more likely it is that typical patients would place high value on those outcomes. Patients who place a high value in reducing the symptoms by any amount (such as patients with lower tolerance to pain or with severe symptoms) are more likely to accept receiving corticosteroids. The weak recommendation for corticosteroids also reflects the concerns that the panel had with acceptability. Specifically, how acceptable is it to treat a condition that is usually not severe and is self limiting with a drug that many patients, practitioners, and other stakeholders know is almost always used for more severe diseases. The systematic search for empirical data on patients’ values and preferences related to sore throat identified 4149 references that were screened at the title and abstract level. From these, we screened 99 full text articles, from which only two provided relevant information on patients’ values and preferences (see appendix 1 on bmj.com). Neither of the studies provided additional data that had not been raised by the panel members: the panel had identified appropriate patient-important outcomes and considered the variability in patient values and preferences regarding sore throat management. 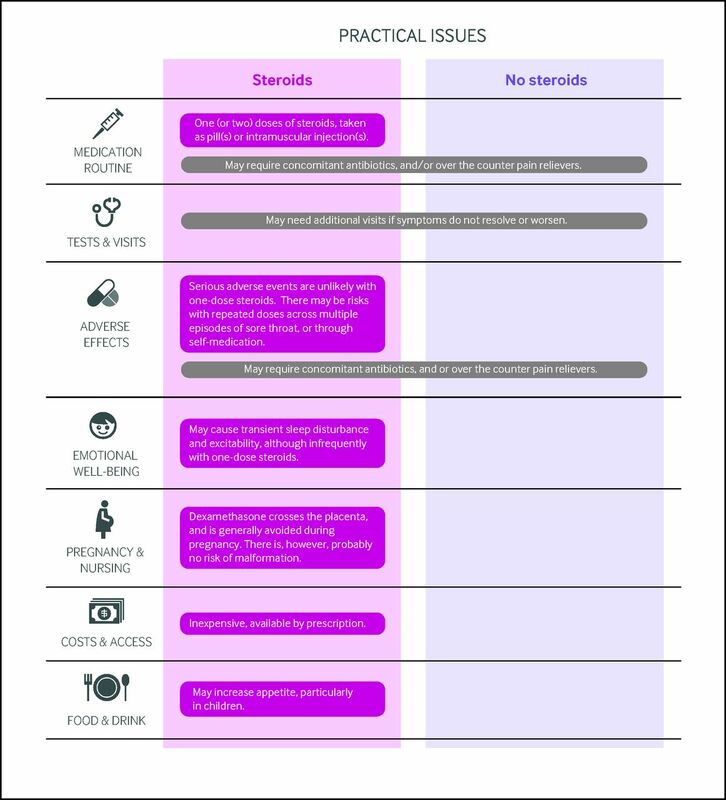 Figure 2⇓ outlines the key practical issues for patients and clinicians discussing adjunct steroids for sore throat, which are also accessible along with the evidence as decision aids to support shared decision-making in MAGICapp. Steroids are typically given as 10 mg dexamethasone (or adapted to weight for children: 0.6 mg/kg, up to a maximum dose of 10 mg), typically taken as pill or intramuscular injection. The risks may outweigh the benefits when larger cumulative doses of corticosteroids are given to patients who experience multiple episodes of sore throat, either through multiple visits or for patients who self medicate if prescribed more than one pill for their previous episode. To mitigate this issue, clinicians should administer the medication in office if possible or prescribe only one dose per visit. The panel focused on the patient perspective rather than that of society when formulating the recommendation. Given the low cost of corticosteroids for treating sore throat, implementation of this recommendation is unlikely to have an important impact on the costs for health funders. The treatment is inexpensive and likely to be offered in the context of a consultation that would have taken place anyway. Nevertheless, it remains uncertain whether it may increase the proportion of patients visiting a doctor to get a prescription of corticosteroids. Are there any severe adverse effects of using one-dose of steroids for treating sore throat? What are the effects of corticosteroids, in addition to standard care, in patients with recurrent episodes of acute sore throat? How do you currently approach giving advice for those with acute sore throat? Do you consider offering corticosteroids? The recommendation for corticosteroid use is weak, and patient’s preferences are likely to vary. What information could you share with your patient to help reach a decision together? Have you learnt one thing from this article that might alter how you consult with patients with sore throat? How might you share this information with colleagues to learn together? To what extent do you practice shared decision making for such preference-sensitive decisions? Five people with lived experience of sore throat were full panel members. These panel members identified important outcomes, and led the discussion on values and preferences. These patient representatives agreed that while small reductions in pain severity and time to complete pain resolution (for example 12 compared to 24 hours) were important to them, these values may not be shared by all patients; they expected moderate to great variability in how much importance other patients would place in small reductions in pain. These panel members participated in the teleconferences and email discussions and met all authorship criteria. This BMJ Rapid Recommendation article is one of a series that provides clinicians with trustworthy recommendations for potentially practice changing evidence. BMJ Rapid Recommendations represent a collaborative effort between the MAGIC group (www.magicproject.org) and The BMJ. A summary is offered here and the full version including decision aids is on the MAGICapp (www.magicapp.org), for all devices in multilayered formats. Those reading and using these recommendations should consider individual patient circumstances, and their values and preferences and may want to use consultation decision aids in MAGICapp to facilitate shared decision making with patients. We encourage adaptation and contextualization of our recommendations to local or other contexts. Those considering use or adaptation of content may go to MAGICapp to link or extract its content or contact The BMJ for permission to reuse content in this article. Competing interests: All authors have completed the BMJ Rapid Recommendations interests disclosure form and a detailed, contextualised description of all disclosures is reported in appendix 2 on bmj.com. As with all BMJ Rapid Recommendations, the executive team and The BMJ judged that no panel member had any financial conflict of interest. Professional and academic interests are minimised as much as possible, while maintaining necessary expertise on the panel to make fully informed decisions. Transparency: B Aertgeerts affirms that the manuscript is an honest, accurate, and transparent account of the recommendation being reported; that no important aspects of the recommendation have been omitted; and that any discrepancies from the recommendation as planned (and, if relevant, registered) have been explained. Evans CE, McFarlane AH, Norman GR, Neale KA, Streiner DL. Sore throats in adults: who sees a doctor?Can Fam Physician1982;358:453-8.pmid:21286075.
van Driel ML, De Sutter A, Deveugele M, et al. Are sore throat patients who hope for antibiotics actually asking for pain relief?Ann Fam Med2006;358:494-9. doi:10.1370/afm.609 pmid:17148626. NIVEL Primary care database: Netherlands Institute for Health Services Research; 2012. www.nivel.nl/en/dossier/nivel-primary-care-database. Truyers C, Goderis G, Dewitte H, Akker Mv, Buntinx F. The Intego database: background, methods and basic results of a Flemish general practice-based continuous morbidity registration project. BMC Med Inform Decis Mak2014;358:48. doi:10.1186/1472-6947-14-48 pmid:24906941. Barnett ML, Linder JA. Antibiotic prescribing to adults with sore throat in the United States, 1997-2010. JAMA Intern Med2014;358:138-40. doi:10.1001/jamainternmed.2013.11673. pmid:24091806. Bird JH, Biggs TC, King EV. Controversies in the management of acute tonsillitis: an evidence-based review. Clin Otolaryngol2014;358:368-74. doi:10.1111/coa.12299. pmid:25418818. Thompson M, Vodicka TA, Blair PS, Buckley DI, Heneghan C, Hay AD. TARGET Programme Team. Duration of symptoms of respiratory tract infections in children: systematic review. BMJ2013;358:f7027. doi:10.1136/bmj.f7027. pmid:24335668. Rea TD, Russo JE, Katon W, Ashley RL, Buchwald DS. Prospective study of the natural history of infectious mononucleosis caused by Epstein-Barr virus. J Am Board Fam Pract2001;358:234-42.pmid:11458965. Scottish Intercollegiate Guidelines Network. Management of sore throat and indications for tonsillectomy (SIGN 117). 2010. www.sign.ac.uk/sign-117-management-of-sore-throat-and-indications-for-tonsillectomy.html. Little P, Stuart B, Hobbs FD, et al. DESCARTE investigators. Predictors of suppurative complications for acute sore throat in primary care: prospective clinical cohort study. BMJ2013;358:f6867. doi:10.1136/bmj.f6867 pmid:24277339. Atula T. Corticosteroids for sore throat. Evidence-Based Medicine Guidelines. 2014. www.ebm-guidelines.com/ebmga/ltk.naytaartikkeli?p_artikkeli=evd07095#refs. Ebell MH, Smith MA, Barry HC, Ives K, Carey M. The rational clinical examination. Does this patient have strep throat?JAMA2000;358:2912-8. doi:10.1001/jama.284.22.2912 pmid:11147989. Chiappini E, Regoli M, Bonsignori F, et al. Analysis of different recommendations from international guidelines for the management of acute pharyngitis in adults and children. Clin Ther2011;358:48-58. doi:10.1016/j.clinthera.2011.02.001. pmid:21397773. Del Mar CB, Glasziou PP, Spinks AB. Antibiotics for sore throat. Cochrane Database Syst Rev2006;(4):CD000023. doi:10.1002/14651858.CD000023.pub3. pmid:17054126.
van Driel ML, De Sutter AI, Habraken H, Thorning S, Christiaens T. Different antibiotic treatments for group A streptococcal pharyngitis. Cochrane Database Syst Rev2016;358:CD004406. doi:10.1002/14651858.CD004406.pub4. pmid:27614728. Sadhegirad B, Siemieniuk R, Brignardello-Petersen R, et al. Corticosteroids for treatment of sore thoat: a systematic review and meta-analysis of randomized trials. BMJ2017;358:j3887. doi:10.1136/bmj.j3887. Agoritsas T, Heen AF, Brandt L, et al. Decision aids that really promote shared decision making: the pace quickens. BMJ2015;358:g7624. doi:10.1136/bmj.g7624. pmid:25670178. Waljee AK, Rogers MA, Lin P, et al. Short term use of oral corticosteroids and related harms among adults in the United States: population based cohort study. BMJ2017;358:j1415. doi:10.1136/bmj.j1415. pmid:28404617. Agoritsas T, Merglen A, Shah ND, O’Donnell M, Guyatt GH. Adjusted analyses in studies addressing therapy and harm: users’ guides to the medical literature. JAMA2017;358:748-59. doi:10.1001/jama.2016.20029. pmid:28241362. Fernandes RM, Oleszczuk M, Woods CR, Rowe BH, Cates CJ, Hartling L. The Cochrane Library and safety of systemic corticosteroids for acute respiratory conditions in children: an overview of reviews. Evid Based Child Health2014;358:733-47. doi:10.1002/ebch.1980 pmid:25236311. Hayward GN, Hay AD, Moore MV, et al. Effect of oral dexamethasone without immediate antibiotics vs placebo on acute sore throat in adults: a randomized clinical trial. JAMA2017;358:1535-43. doi:10.1001/jama.2017.3417 pmid:28418482. Hayward G, Thompson M, Heneghan C, Perera R, Del Mar C, Glasziou P. Corticosteroids for pain relief in sore throat: systematic review and meta-analysis. BMJ2009;358:b2976. doi:10.1136/bmj.b2976. pmid:19661138. Hayward G, Thompson MJ, Perera R, Glasziou PP, Del Mar CB, Heneghan CJ. Corticosteroids as standalone or add-on treatment for sore throat. Cochrane Database Syst Rev2012;358:CD008268. doi:10.1002/14651858.CD008268.pub2. pmid:23076943. Korb K, Scherer M, Chenot JF. Steroids as adjuvant therapy for acute pharyngitis in ambulatory patients: a systematic review. Ann Fam Med2010;358:58-63. doi:10.1370/afm.1038. pmid:20065280. Wing A, Villa-Roel C, Yeh B, Eskin B, Buckingham J, Rowe BH. Effectiveness of corticosteroid treatment in acute pharyngitis: a systematic review of the literature. Acad Emerg Med2010;358:476-83. doi:10.1111/j.1553-2712.2010.00723.x pmid:20536799. Siemieniuk RA, Agoritsas T, Macdonald H, Guyatt GH, Brandt L, Vandvik PO. Introduction to BMJ Rapid Recommendations. BMJ2016;358:i5191. doi:10.1136/bmj.i5191. pmid:27680768. Vandvik PO, Otto CM, Siemieniuk RA, et al. Transcatheter or surgical aortic valve replacement for patients with severe, symptomatic, aortic stenosis at low to intermediate surgical risk: a clinical practice guideline. BMJ2016;358:i5085. doi:10.1136/bmj.i5085. pmid:27680583. Guyatt GH, Oxman AD, Vist GE, et al. GRADE Working Group. GRADE: an emerging consensus on rating quality of evidence and strength of recommendations. BMJ2008;358:924-6. doi:10.1136/bmj.39489.470347.AD. pmid:18436948. Andrews JC, Schünemann HJ, Oxman AD, et al. GRADE guidelines: 15. Going from evidence to recommendation-determinants of a recommendation’s direction and strength. J Clin Epidemiol2013;358:726-35. doi:10.1016/j.jclinepi.2013.02.003. pmid:23570745.